If you can’t garden, go snowshoeing! How many times have I said this! You see, we can’t garden in the winter, there is just no way. Temperatures here drop to – 40 Celsius! Cold frames would get really cold and greenhouses would need lots of energy to keep going. So except for the indoor garden we are just enjoying a break, that’s kind of nice, too. 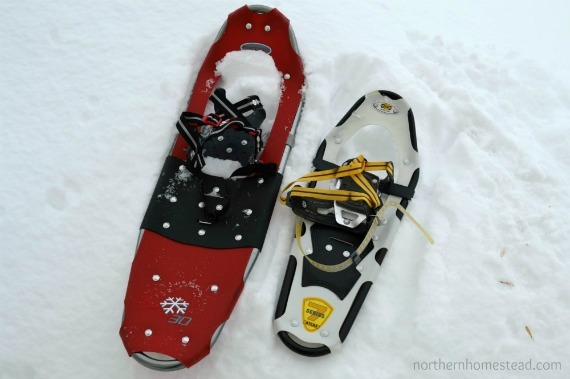 Snowshoeing is a fun winter activity. The history of snowshoeing was necessity. People had to move around in deep snow, so they created some kind off addition to the boots to stay on top of the deep snow. Today it is mostly used for exercise and fun. I was introduced to snowshoeing by a friend and liked it immediately. 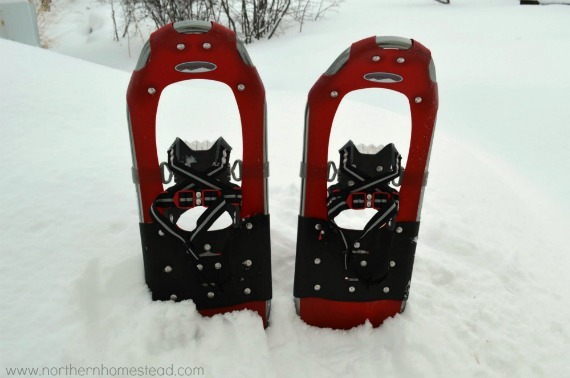 Snowshoes are an extension to your shoes, you just buckle them on your boots and you are ready to go no mather how deep the snow. There are many different brands, and it really depends on your preferences; a wide variety of comfortable, and easy-to-use snowshoes. When choosing snowshoes the size is the most important thing. It is not about your shoe size, it goes by your body weight. The lighter you are, the smaller they can be. Also women snowshoes are more narrow at the back, just because we walk a bit different. Here is a picture of my hubby’s and mine :). Hiking Poles are helpful too. Depending, of course, where you snowshoe, but once you’ve started why not go for a mountain trip. The possibilities are endless, the only thing you need is snow – the more the better. Official trails in town, country, and mountain areas, as well as farmers fields and golf course places. Just make sure the area is publicly accessible and not enclosed with a no trespassing sign. We love to go just out of town as well as once in a while a mountain trail. Golf course places are fun too, no one is golfing there in the winter anyways, chances are that you have the place to yourself; great for snowshoeing. 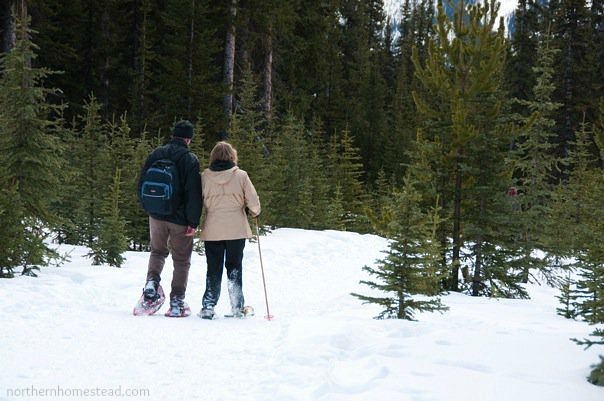 Snowshoeing is a great workout, expect to get sweaty! It is more of a workout than just walking or even cross country skiing. Powder snow will make you work out even more. Depending on how much you sink in, you will have to work your way. However, it is lots of fun too. This winter has been very snowy in our area, I love it! I know there are some sore backs from snow shoveling, and I am sorry for those, but it also looks so pretty and is just great for snowshoeing. Walking on top of the snow on a sunny Sunday afternoon is very enjoyable. I’ve always wanted to go snowshoeing! Even thought it’s cold here in the south, there’s no snow . . . yet. I’m putting this on my “to do” list! I totally would miss the snow, if I lived somewhere where there isn’t any. But then again, I would enjoy gardening year round so much, too. Now that does look like fun in the snow! I’m certain that is a great workout! Wish we got a bit of snow for such fun activities. On the other hand, we can garden around the year. Do not rob all the snow in, ok ;). You would love snowshoeing, I am sure. I noticed how much snow there was up there when we visited over Christmas. We’ve yet to try snowshoeing but it looks like so much fun! I’m not sure why we haven’t tried either because we get such deep snow here. I do love cross country skiing too, but again, something I haven’t done in a long while, I’m going to blame pregnancies & babies on this one! We love just playing in the snow with the kids, then coming in for hot cocoa or tea.